This is what I love about blogging. I love that I can ask people to help a little boy using only social media--blogging, Twitter, Facebook--and have it fully funded in two days. And I love that the people who helped aren't necessarily the friends that would have helped if I sent letters to all of my IRL friends. Of course Victoria and my mom quickly donated--as well as my sweet little cousin Leanne and my fake mom, Mrs. B. Two blog friends that I've never even met, but feel like I know from their ramblings about books and life in general, were generous donors. 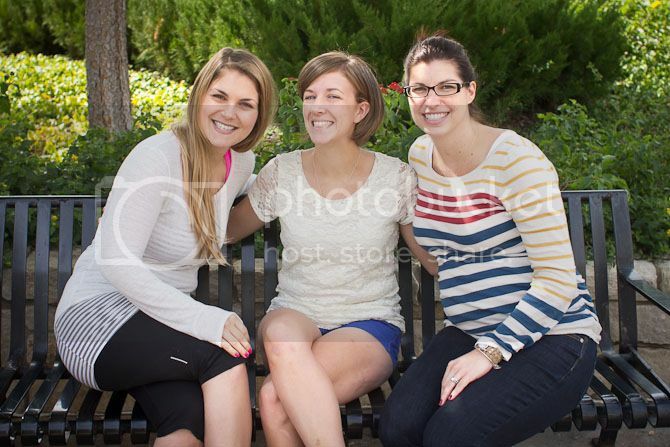 An old high school friend, my pledge daughter, and two sorority sisters who I also stay in touch with through the old blog (and Facebook and Twitter!) helped out. And my friend Alison--who I'd stay in touch with no matter what, but am happy to stay in touch with through her little blog and Victoria's friend Anne, who I've never met, but have heard so much about. Thanks to all of them. I'm so excited that we could help out little Hope. And if you still want to help even though Hope's all taken care of, there's a couple other kids with clubfoot waiting to be funded as well as TONS of other kids with other ailments. So THANK YOU. Thanks so much to all you sweet readers who donated. We're currently making the rounds in Kansas and it's always funny to find out who reads the blog. I'll see good friends who (apparently) don't spend hours reading blogs online and have to be caught up on our lives (which I don't mind at all--then I get to tell all our stories to fresh ears!) And then I'll meet new friends at weddings who will confess that they read my blog--hi Katie! It's just so fun. Blogs. If I've said it once, I've said it a million times. You should blog. It connects you to great, great people and is a fantastic way to keep a record of your lives. You'll never regret blogging. And sometimes it pays off big and you get to help sweet little boys have their feetsies fixed. 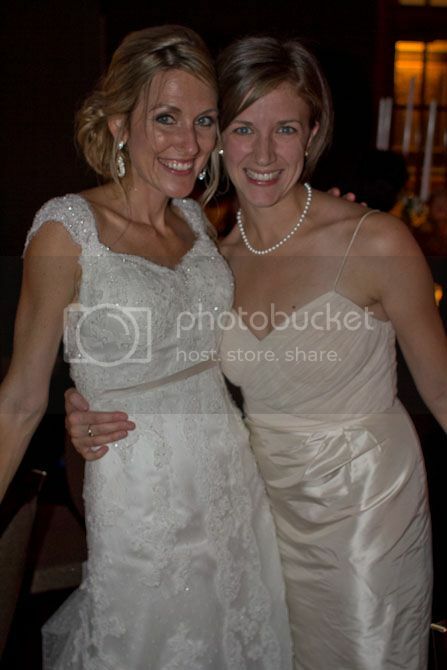 And a few quick pictures of our time so far in Kansas... first, me and the Heidi, the pretty bride. She and Alex are dear friends from K-State and Boston who finally got married. You might remember them from here. We had lunch with Hillary, Rhonda and Allie (not pictured) and had a few minutes to catch up on all their lives. I love seeing high school friends--I'm so blessed to still have girls I love so much from so long ago. We're currently in Lawrence with our friends Riley and Julia, who used to live in the DC area and abandoned us for the homeland. Alison popped by with teeny Dinah and we MIRACULOUSLY got a picture with all our kids looking at the camera. How cute are they? They played very sweetly together and were generally adorable. Oh sweet babies. Ok, one - you have to totally text me to remind me "Hey, Loser, remember to donate to my cause" because otherwise I forget and then I don't get cool shout outs for being generous on your blog and feel like I stink at life. And two - Henry is looking at this with me and he goes "hey!! hey look!" and I said "who is that Henry?" and he goes "thats friends." Awww!! Love Henry's response above! AND how many conversations have you had while you have been here about who is going to marry who? Harper, Olivia for Finn? Dinah for Benjamin or Braden? THE OPTIONS. 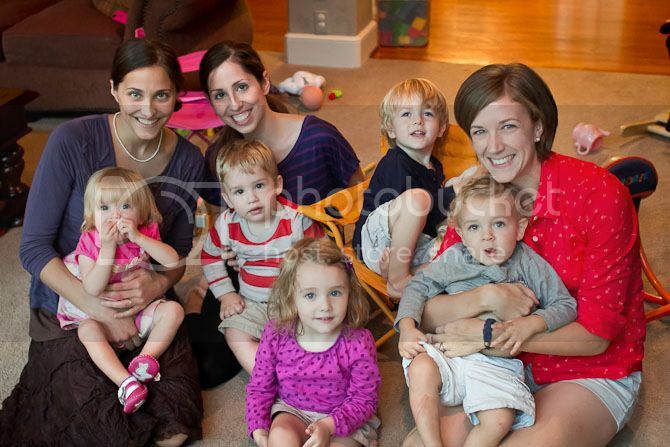 Someone's a photo genius for getting those five cute kiddos to look at the camera. Really. I was happy to contribute to the cause Rachel and thrilled that I was lucky to finish off the funding. I really like how people are now using marathons to support great causes. One of Jerry's co-workers is supporting an autism organization. I could not run a marathon if my life depended on it but I can support those who do! Have a great time in Kansas and Chicago..